Wall-to-wall hit tunes, ear-to-ear grin all night long F U N ! 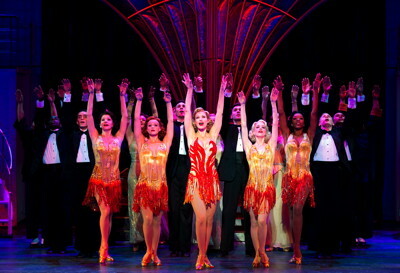 – Cole Porter’s timeless classic musical theatre masterpiece, Anything Goes, has set sail at the Center Theatre Group/Ahmanson Theatre in a new Broadway revival and continues through January 6, 2013. 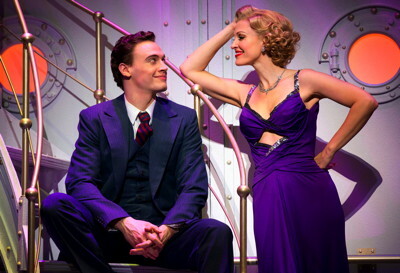 The fluffy, madcap and satirical storyline concerns a young man Billy Crocker (Erich Bergen) who is in love with an ingénue Hope Harcourt (Alex Finke). The obstacle to their romance is that she is betrothed to a wealthy Brit, Lord Evelyn Oakleigh (Edward Staudenmayer) – a union that her gold-digging mother Mrs. Evangeline Harcourt (Sandra Shipley) is eager to secure. Meanwhile, a gangster named Moonface Martin (Fred Applegate) – humiliatingly only listed as Public Enemy #13 – and his moll Erma (Joyce Chittick) are on board, as well as a handful of other characters, including our hero’s friend, nightclub singer Reno Sweeney – a brassy, older woman who gives him hard-boiled advice, played superbly by Rachel York. 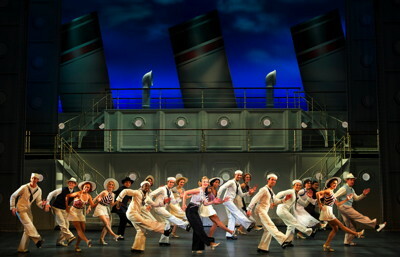 The show is mostly set at sea, on a transatlantic voyage from New York to London, although a scene in an exceptionally well-stocked bar precedes the reveal of the spacious set representing the main deck of an immense, three-funneled ocean liner on which the action takes place thereafter. 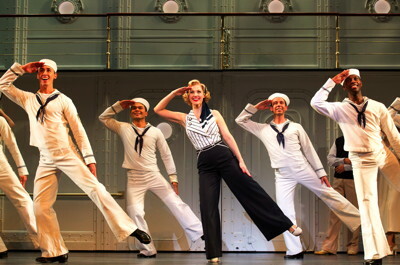 Cole Porter composed the music and lyrics for Anything Goes in 1934 and the show was first staged in YYY. 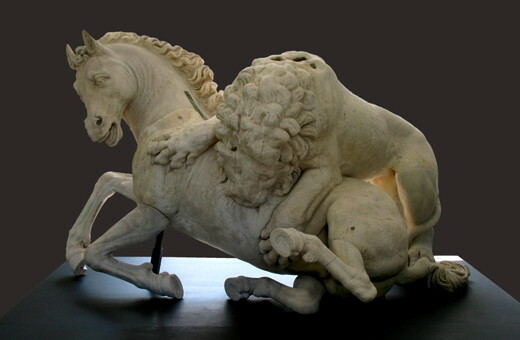 The original book was a collaborative effort by Guy Bolton and P.G. Wodehouse, and later heavily revised by the team of Howard Lindsay and Russel Crouse. This current production was reworked by librettist John Weidman and Timothy Crouse (Russel’s son) in 1987 for a Broadway revival. Notably, the pair stepped up the pace and balanced songs and dance numbers with an equal measure of dialogue. Director/Choreographer Kathleen Marshall earned a Tony award for her vibrant choreography in 2011. Apparently several hit tunes were later added to the original score which explains why the show feels a bit like Cole Porter’s greatest hits. Of course there’s only a slim storyline linking all the song and dance numbers and, despite a few obstacles, several couples are paired off for the obligatory, sunny happy ending. 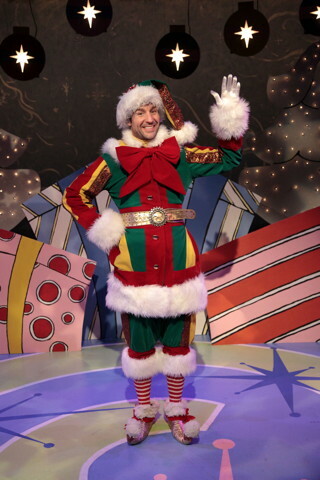 An extended tap sequence involving the entire cast at the end of Act One is a highlight. Also of note is the splendid original scenic design from Derek McLane and the gorgeous period costumes courtesy of Martin Pakledinaz. Erma’s white and lime green travelling suit is especially eye catching, managing to be both chic and brassy at the same time, not to forget the numerous elegant and swanky silk gowns for our leading lady Rachel York. Anything Goes is a fun show to bring even a tween kid to see. Dinner, followed by Anything Goes. Champagne, desserts and dancing after the performance.